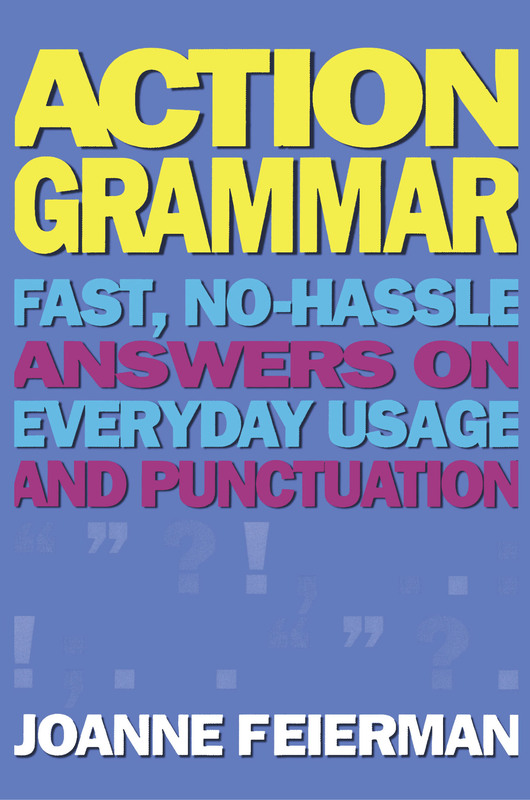 Organized to give you fast, easy answers to the questions that come up most often, Action Grammar features useful exercises to help you sort out the more puzzling points of spoken and written English, as well as dozens of up-to-date examples of correct (and incorrect) usage, from where to put a comma to when to use "me" rather than "I." For everyone who wants to use the right word in the right place, punctuate properly, and spell correctly, here's a must-have reference that will do wonders for your command of the language. That sure is a great school. It's practical. They don't teach no goddamn grammar there. Well, I'm exaggerating. Your English teacher didn't tell you lies. But she or he probably taught you rules of English that are no more. Were you taught any of the "rules" below? If you were, read this chapter. 1. You may not start a sentence with because. 2. You may not start a sentence with and or but. 3. Sometimes periods and commas go inside the quotation marks and sometimes they go outside; it depends on the sentence. 4. You may not end a sentence with a preposition. 5. You may not split an infinitive. Here is the most up-to-date information on these issues. You certainly may. This much-believed "rule" has never been found in any book of grammar! I made $100,000 on a stock because I got a great tip. Because I got a great tip, I made $100,000 on a stock. Both of these sentences are absolutely, positively correct. If this is true, why do you and I remember being told, in no uncertain terms, that you can't start a sentence with because? The answer is this: Teachers in primary grades wanted to instill in their students the habit of writing and speaking in full sentences, not sentence fragments. If your teacher asked, "Why did you make $100,000 on a stock?" and you answered, "Because I got a great tip," she would most likely say, "You can't start a sentence with because." What she should have said was, "Please make that a complete sentence." Because I got a great tip is a cliff-hanger; it's a sentence fragment and needs to be finished. But instead, she just said, "You can't start a sentence with because." Due to the fact that I got a great tip, I made $100,000 on a stock. False. Good writers do it all the time. Take a look at The New York Times, The Wall Street Journal, or any other major publication; you'll see many sentences that start with and, but, and even so! I look forward to seeing you next week. And completing the contract by the first of July. And completing the contract by the first of July is not a sentence and can't stand alone. However, to write And I hope we can complete the contract by the first of July would be perfectly fine. This starts with and, yet it contains a complete sentence: I hope we can complete the contract by the first of July. 1. I look forward to seeing you next week and completing the contract by the first of July. 2. I look forward to seeing you next week; I hope we can complete the contract by the first of July. 3. I look forward to seeing you next week, and I hope we can complete the contract by the first of July. 4. I look forward to seeing you next week. I hope we can complete the contract by the first of July. No -- well, at least not in America. In the United States, periods and commas always go inside quotation marks. That's our rule, and it is followed scrupulously by all professional writers. Do I hear an objection? Did you say our rule makes no sense? After all, in example two the letter was stamped "Personal and Confidential" and not "Personal and Confidential," -- and therefore, you ask, shouldn't the comma come after the quotation marks? Well, I agree with you, but that is not the rule. And what about the third example? Only one word is quoted. Does the period still go inside? The answer is yes. This is the American system. The rest of the English-speaking world uses the more logical system, as do publications of international bodies such as the United Nations. The only Americans who do not follow the American style in this matter are lawyers. For more information on this issue, see Rule 10, page 72. Much has been written on this topic -- in fact, too much has been written about it. The story is told that Winston Churchill was once criticized for using a sentence that ended with a preposition. He was angry; he responded: "That is the kind of English up with which I will not put." His meaning is clear: Don't rework a sentence into a totally awkward one to avoid ending a sentence with a preposition. Not ending a sentence with a preposition is a guideline, not a rule. This is the report I want to talk with you about. I want to talk with you about this report. The second sentence is clearer and more forceful. This is the report about which I want to talk with you. An infinitive is the word to plus a verb, for example, to review, to explain, to understand. In the following sentence, the infinitive, to review, is split by the word carefully. Her responsibility was to carefully review the data. Her responsibility was to review the data carefully. Do not split an infinitive unless not doing so leads to a confusing or awkward sentence. In the following examples, the sentence with the split infinitive is preferable to the unsplit ones because it's the clearest; it puts the emphasis in the right spot. I would like you to personally supervise the clerk. I would like you personally to supervise the clerk. I would like you to supervise the clerk personally. Joanne Feierman, president of Seminars in Communication, teaches business and technical writing at Fortune 500 companies. She lives in New York City with her husband, two children, and an overweight cat. J. Frederick Reynolds Professor Of English, City College of the City University of New York Action Grammar is a clear and easy-to-understand handbook designed to help work-world writers and students solve the sticky little problems that often frustrate them when they sit down to write letters, memos, reports, and proposals...accurate, easy to use, and fun to read. I highly recommend it. Richard Lederer Author Of the Write Way Action Grammar accomplishes just what its title promises. It puts grammar into action by concisely presenting the essential rules of usage and punctuation and illustrating these rules with real-life examples, Joanne Feierman approaches the intricacies of our English language with a clarity and humor that will appeal to all.